Ensure your new PC is built to last with the Intel Core i5-3470 Ivy Bridge Quad-Core 3.2GHz processor. With four cores and a 6MB cache, this powerful 3rd generation Intel processor delivers excellent performance when running multiple applications. Smart features allow the PC to adapt to each individual user, as it accelerates in response to deal with the most demanding tasks while consuming less power when such effort is not required. Included is an Intel HD Graphics 2500 graphics card, which can even handle basic graphic and video functions without the need for a standalone graphics card - making this CPU a speedy and cost efficient option for users that do not play the most intensive games. An excellent midrange LGA 1155 socket CPU, it forms a solid foundation for an impressive home computer. 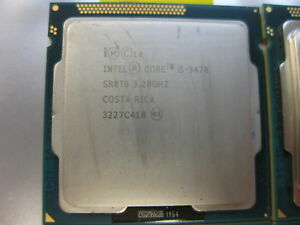 Processor Type Core i5 3rd Gen.
Got this for a fair price. Installation was straight forward and arctic silver thermal paste was applied and a cooler master cooling system was installed. Operating system installation went smoothly and the system has worked perfectly from the start. Highly recommend it. I am unable to comment on this processors performance or reliability because, while the motherboard's BIOS saw and recognized the processor, I was unable to get any OS from Windows 7 on up through Windows 10 to install. Once I removed the processor and downgraded to a Pentium processor, all was good so it definitely was the processor. It could be that it just wasn't compatible with the MOBO even though the manufacture's website stated it was. I am unable to tell at this time if the processor is good or bad but since the MOBO's BIOS recognized it, I can only assume at this time that it was a compatibility issue. Bought the i5 3470 for a HTPC build intended for video streaming and light gaming. works pretty well for cpu intensive games like GTA V, able to maintain 60+ FPS paired with a 1050 ti at 1080p/high settings. temperatures are very good in the small node 202 case with a tiny cryorig c7 heatsink. I have never seen it above 65C... So i'd say if you are looking to build a gaming pc or HTPC on the cheap look at one of these and a used h77/z77/b75 mobo to start. I guess the bad side is it's not as powerful as a K skew processor (3570K, 3770k..etc) due to the lower stock clock speeds and the inability to overclock. But you also will have to pay quite a premium on the used market for the overclockable chips. In most cases iv'e seen on ebay you might as well look at a new 6600/7600k if your looking for something overclockable, I wouldn't advise going back to the 2500/or2600ks as the ram support and the boards themselves are stating to feel a bit dated and they just don't seem to preform as well in my experience. Best 3rd Gen Processor for a reasonable price! Easy to install. Better performance. According to my opinion Intel Core i5-3470 3.2GHz Quad-Core Processor is one of the best products to try with LGA 1155 platform. Price also reasonable.